I have been wearing scarves non-stop as of recent. I love what a versatile accessory they have become! I enjoy wrapping them around my neck the traditional way, folding the square ones diagonally and wrapping them around, and also folding them over my arms for a poncho/cape type look. Oh, and I even used a blanket scarf as a blanket the other day! Madeline had fallen asleep in my arms, and my scarf laying out was the closest thing I could reach for. So, yes they even make for the perfect blanket (I guess they aren't called blanket scarves for nothing!). Something I love even more is how reasonably priced scarves are. Every single one listed above is under $50, many of them being under $30. I love and own several of these. The infinity scarves are great because they don't feel so bulky around your neck, but if you're fine with the bulkiness, blanket scarves can be so much fun! Throw a scarf over your favorite tee (this one is mine) and pair that with denim, booties, and top the look off with a hat, and there you have it! This has become my go-to fall look. 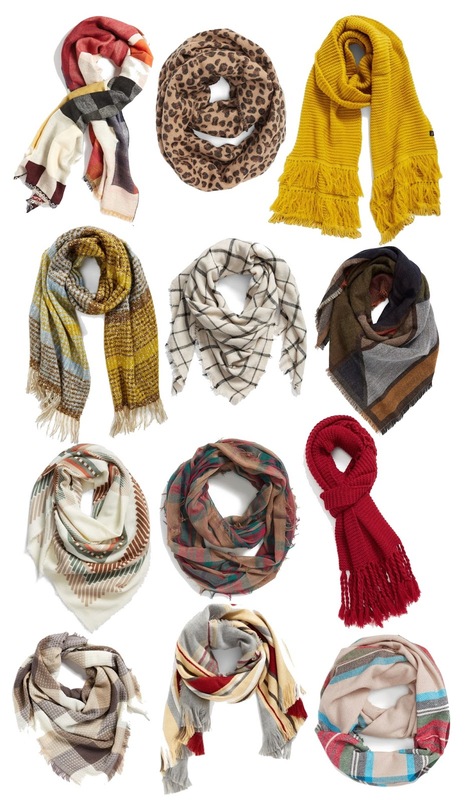 Not to mention, scarves make the perfect gift to give to your friends. I love the idea of gift guides! I'd love a fun gifts for girlfriends guide--you know those gifts that are SO fun to buy and give that people tend to feeling guilty buying for themselves. Different price points in one guide would be great (under $25, under $50, under $100, $100+)!